FFI Pilates 100 video from modified to advanced. Here we will practise the Pilates 100, but modified, in preparation for you to build strength, to do Joe Pilates original 100. Other benefits of The 100 modified, is to strengthen the clients core around a neutral spine and challenge you to hold a neutral spine. Start in the base position above. Set up neutral spine, centre yourself and breathe lateral thoracic. To challenge neutral, float your left leg to the table top position above with control. Hold this position static, without loss of neutral for up to 50 counts. Breathing in for 5 counts and out for five counts, for up to 5 cycles of your breath. Lower your left leg and repeat the same sequence on the right side. Master this level before moving on to the next level below. From base position, float one leg, then the other to the table top position above and maintain a neutral spine. Place your hands by your sides on the floor, then hold this position for up to 10 breath cycles. 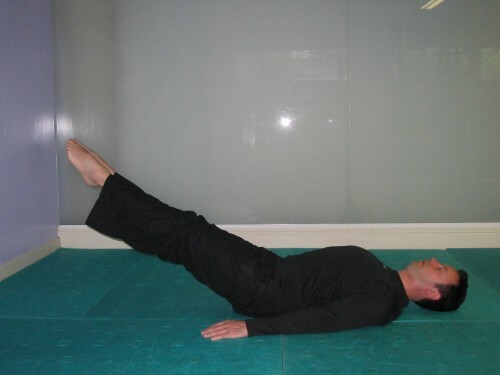 Avoid your abdominal wall doming to the ceiling throughout, in other words, stay centred. Master this level before moving onto the next level below. Once you can hold neutral with a good core and abdominal contraction with two legs in the coffee table position you may progress this movement by adding longer levers. Be careful when you decide to do this as it will be quite agressive on your back. So go from two legs in coffee table towards longer legs, but not fully lengthened. Monitor your spinal position and abdominal area. There should be no loss of quality just to make the movement harder. This is still done in neutral spine with the head down. When you lengthen your legs more, go for a high foot position as this will be less stressful on the lower back. If you reach the point of struggle, return back to a shorter leg position to finish the 100. To do the original method you will have to come out of neutral spine and lift the head off the floor. The safer way to do this is to start with the head down and both legs in coffee table position. Center yourself, as you lift your head and hold the backs of your hamstrings. Flatten your lower back into the ground and lengthen the back of your neck (chin towards chest). Straighten both legs up to the ceiling with your toes pointed and legs together. Ensure your legs are straight. Hold the leg height position where you can stay for up to ten breath cycles without struggle and with quality. You may pulse your straight arms up and down an inch or two. So 5 pulses up and down to breathe in and 5 pulses up and down to breathe out. If you start with your legs straight and you begin to struggle, bend your knees slightly to modify. To challenge this movement, try to do the movement with your legs lower, so your toes will be around eye level. To finish, pull your legs back to coffee table position, lower your head, then lower one foot at a time to the ground.